The first story of the Laurel Ridge novella series is coming soon!! To appear on Amazon as an e-book! Seven stories with seven couples. Each couple with their own story, told against the backdrop of a small southern community of Laurel Ridge, Georgia. 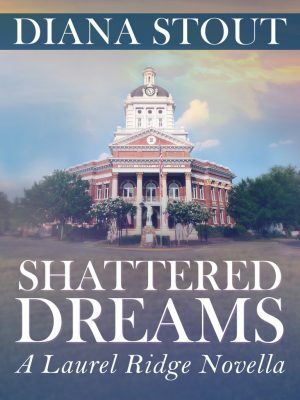 SHATTERED DREAMS – Mason Baylock has returned to his hometown as a newly appointed judge. He’s hoping to reconnect with his high school sweetheart, Shelley Willis, but she’s not interested. To keep him foremost in her mind, he frequents the diner, located across from the courthouse and where Shelley works, on a regular basis. Once a week for the more than the past three months, he’s been asking her out. And, once a week for more than the past three months, she’s been turning him down. And then one evening, they become locked up in the kitchen’s cooler by accident. That’s when there’s no more escaping–the real conversation begins–and where the heat gets turned on. She can’t deny she isn’t attracted to him, but she’s not about to date someone who shattered her dreams years ago, either. And then, she discovers that there is more to the earth-shattering consequences than even she imagined, which threatens to fracture and splinter life as they know it. Will both their dreams be shattered forever? Or does enough of a spark remain that they can rekindle the love they once shared? Sounds like a great concept! Look forward to reading the novellas.